I’ve been training cats since I was little. But I’ve been Cat Behavior Lead for Best Friends since 2014, and a JGF trainer for a few months now. Tell me about your career as a trainer and how you got started. 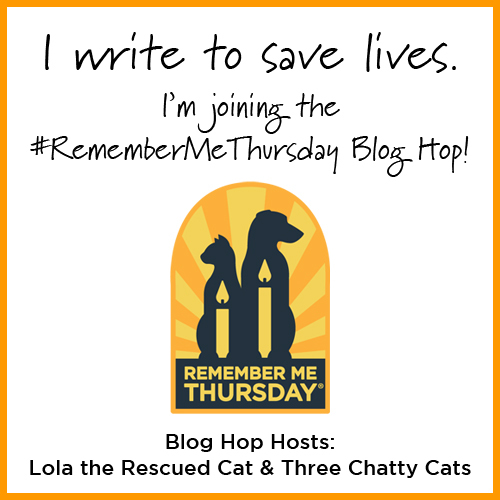 I started volunteering with cats at a city shelter in Orlando, Florida in the 1990s. This was before the days of internet research or Jackson Galaxy being widely known, so I just learned through trial and error. 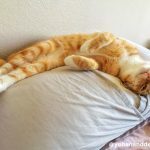 I knew that the cats that weren’t friendly would be euthanized for space, so I did all I could to figure out what made them feel confident and friendly. 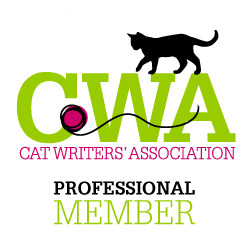 I continued volunteering with cat behavior all of my life, no matter what my career was. 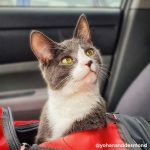 Once I found Best Friends, I decided to make shelter cats my full-time career! 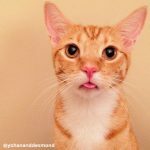 I started as a Cat Caregiver, feeding, cleaning, and medicating hundreds of cats each day. 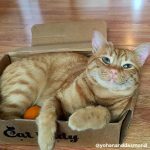 As I went through my daily duties, I noticed that each cat needed something special, like playtime, a head rub, soothing talking – but there was no time for that. Luckily, the Cat Behavior Department soon came to be, and I was able to move into my current role where I can do exactly what I had been wanting to! 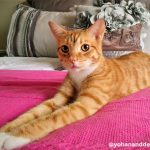 I feel so lucky that I am able to have a job where my main goal is to help cats find confidence and homes. What is the biggest challenge that you’ve encountered while working at Best Friends? I think the biggest challenge for me is saying goodbye (leaving work) at the end of the day. I end up staying late every single day because a certain cat isn’t doing well, or I worry a cat may not make it through the night, and I want to make sure they feel loved. I grab my bag and laptop and head out at closing time, but then I stop off in several different cat rooms on the way to the exit to visit cats that are struggling in some way. It’s difficult to maintain a work-life balance when your heart is so involved. If you could tell readers one thing about Best Friends, what would you want them to know? 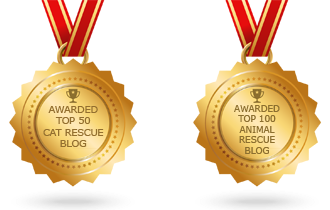 We are trying so hard to end the killing of shelter animals for space. It’s all we think about. 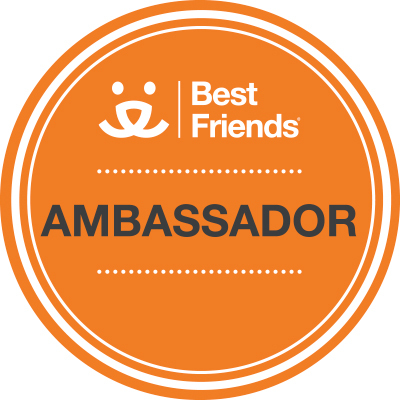 It’s at the forefront of every single person’s brain that works for and volunteers at Best Friends. Everything we do is with the best intentions, and to save them all. 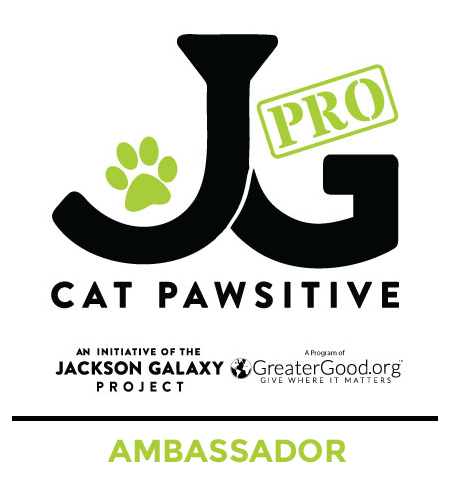 Why did you decide to get involved with the Jackson Galaxy Foundation? Jackson is the best! He has done so much to help shelter cats. He has a wonderful relationship with Best Friends, and we appreciate him so much! I have learned so much from him, and we agree on all things cat behavior. I just want to be involved in everything he and his foundation are accomplishing! I want to help in any way I can. 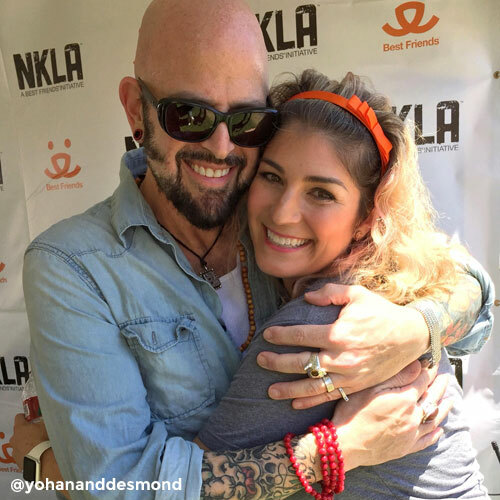 Samantha with Jackson Galaxy at a Best Friends adoption event. I performed as a Disney Princess for years at both Walt Disney World in Florida and Tokyo Disneyland. 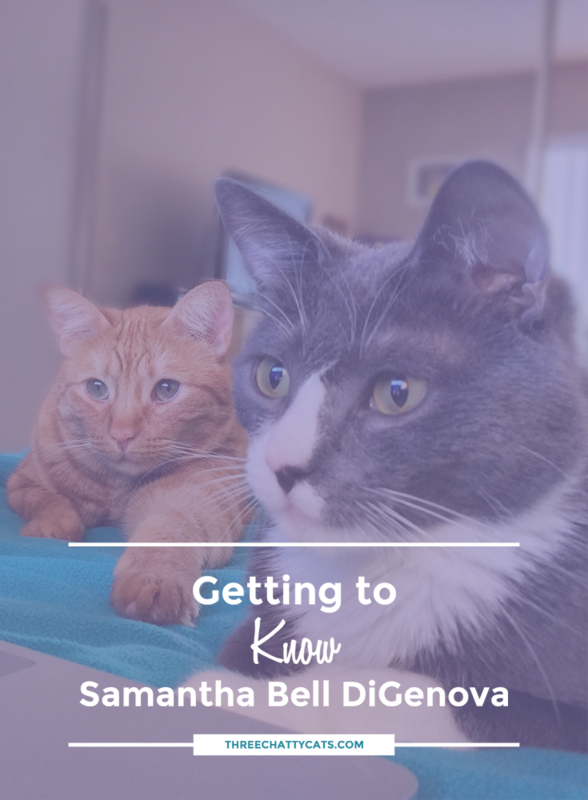 Next up, Samantha talks about her three adopted cats and how they came into her life. 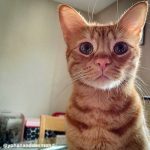 I have three cats and always have a foster cat, too. All three came from the Best Friends Los Angeles Kitten Nursery. I met Yohan when he was a week old, and he was struggling for life in an incubator. I was a volunteer in the nursery at the time, and Yohan helped me fall in love with Best Friends. I started volunteering more and more just so I could see him and feed him, and I started realizing how happy I was there. I finally took him home to foster (fail), and also applied for a job at Best Friends. 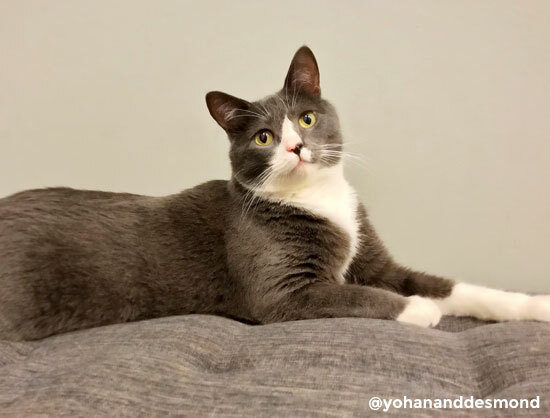 Yohan and his long legs. 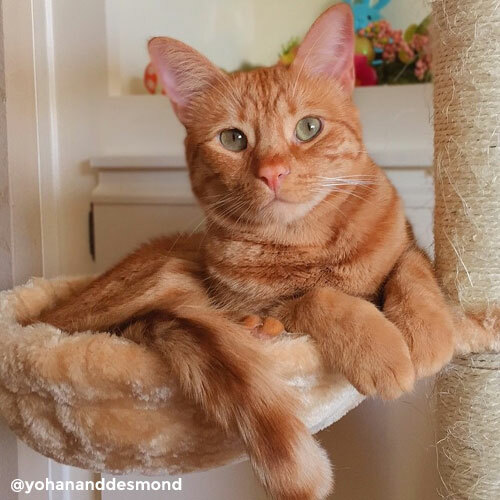 Yohan is very naughty and adores his mom. Desmond is a little angel and adores his dad. Packard is a little miracle. I actually adopted him because he was only supposed to live to be 4 to 6 months old. Packard’s mom arrived at Best Friends with seven tiny, newborn kittens. All of the kittens grew big and strong and went on to be fixed and adopted…except for Packard. We noticed very early on that Packard had some neurological problems and a severe right head tilt. He was separated from his siblings and placed close to our vet for observation. He was on an IV for weeks at a time, couldn’t walk some days, and had a fever of 107 for several days in a row. But every time anyone would approach his cage, he’d start purring, struggle to walk to them, and crawl up to their neck to snuggle in. I visited Packard first thing every day and last thing before I left. I would cry each night because he was so sweet and I wasn’t sure he’d live to see the next day. One day a huge inexplicable abscess appeared on his forehead, and our vet opened up his head and flushed it out. Poor Packard was always a mess, but always so loving. Anytime any of us felt sad at work, we’d say, “Go visit Packard. He’ll make you feel better.” And he did! Packard posing like a pro. Finally, the time came for Packard to be neutered and put up for adoption. The vets weren’t sure what exactly was wrong with him, and figured he’d only have a couple of months to live. We all wanted to make sure that whoever adopted him understood that he would require patience, care, and a lot of vet bills for the rest of his short life. The only way I could be sure that his adopter would properly care for this precious creature was to adopt him myself. And it was the best decision I’ve ever made. Packard makes my heart burst with happiness. He still has the head tilt, he suffered some brain damage, and he is 100% deaf. His skull was being eaten away by a severe bacterial infection that required four head surgeries in four months. Nobody is sure if he’s 100% okay, but he has been doing great for two years. That little guy is the happiest, most loving creature I know. He is so special to me. And, he will be featured on My Cat from Hell as a ‘Cat From Heaven’ this season! The furry family when Packard was a kitten. 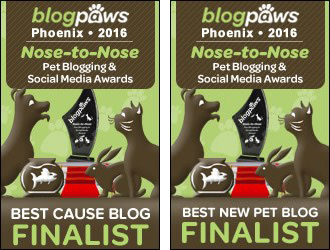 A big thank you to Samantha for sharing with us about her background and her three beautiful adopted cats! 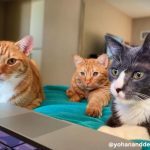 Samantha shares photos of her cats on Instagram, along with adoptables from Best Friends. 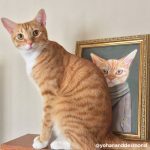 What a wonderfully heart-warming and special post……about a special lady and her work as well as her ADORABLE cats. 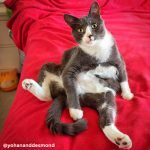 Every cat is totally unique and I can relate to how important it is to get to know each not as “another cat” but as a special little being with special feelings about EVERYTHING. Whenever someone says “just a cat” I cringe…..no such thing! Anyway, bless Samantha and of course Jackson as well as YOU – all of you are doing all you can to make the lives of shelter kitties SO MUCH BETTER. What a great story. Such amazing work. I’m so envious of people who can do this great work full time. And “Packard” is going on my list of potential foster names! So thankful for women like Samantha! And fell in love with her three cats right away. My prayers for Packard. Such a nice lady with wonderful kitties. We admire all she does and we sure enjoyed this post! 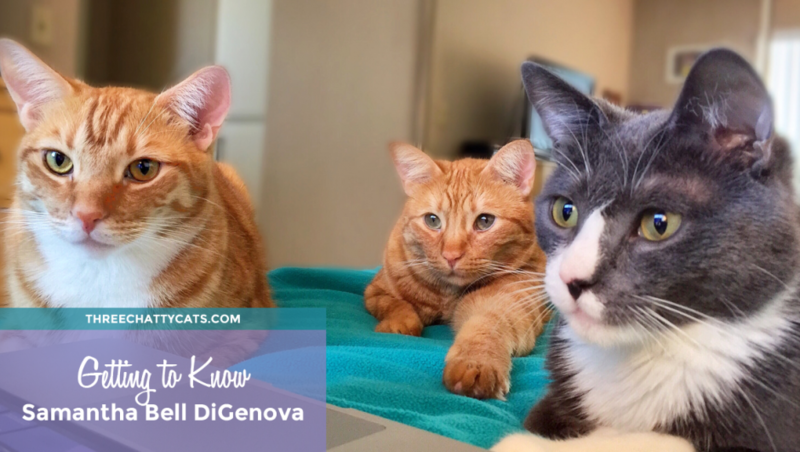 Three amazing felines and one incredible woman dedicated to giving cats the best possible lives. I can’t imagine anything more important than that. We think Samantha has a great job! And her three cats are almost as cute as us. ;) MOL! Thanks for sharing her interview with us. Samantha sounds like a wonderful person. Her kitties are adorable, I am glad they have a forever home with her. A wonderful interview and we thank you for sharing. What a great interview. We enjoyed reading about this awesome family. She’s a special lady. Love that little family. The guy who delivers our pizza has 2 special needs cats. One is blind and the other has brain damage because he was smothered as a kitten. He can’t stop talking about them. Tonight I tried to attack him. MOL! I have always wondered how people end up as dog and cat behaviorists at Best Friends or anywhere else. Though as she says, I can imagine it would be very hard to leave at night. I keep hoping Best Friends will set up a satellite center here in Chicago. Oh, and oh my gosh, Yohan’s little tongue is too much. Adorable. 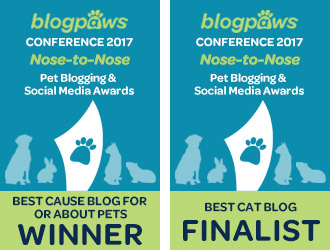 What a wonderpurr story. I’m rooting for Packard to keep going and proving Miracles do happen! WONDERFUL!! Great stories – i can’t wait to see Packard on TV and Yohan and Desmond remind me of Frodo and Zulu! I just love Packard’s story, thank you for sharing it. And congratulations on being able to do what you love and get paid for it.. This is one of those times when “like” just doesn’t cut it! 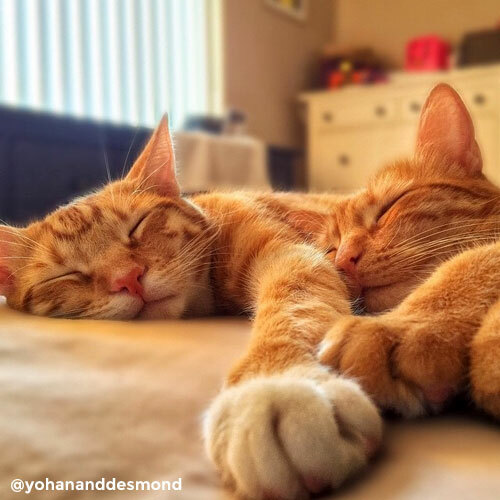 We have 3 cats of our own, and I can’t imagine life without them! So glad your 3 got such a loving home! !